Second in a series by Anne W. Anderson (the other half of we), who visited with each of the studio owners hosting the 2014 Tampa Bay Tour de Clay, a self-directed series of stops stretching from Palm Harbor to San Antonio. As a boy, Palm Harbor potter Ira Burhans, canoed and fished Minnesota’s rivers and lakes. Today, he and his wife, Barbara, also an artist, windsurf, paddleboard, and paddle surf Florida’s coastal waters every chance they get. But time on the water isn’t about escaping from the demands of making a living by producing thousands of casserole dishes and plates and pitchers each year. For Burhans, whose Clay and Paper Studio is the second stop on the south-to-north 2014 Tampa Bay Tourde Clay route, time spent on the water becomes part of the work he shares with others. The wave-traced patterns in the sand, the dappling of reflected light on the water, and the shapes of leaves find their way into the pieces he makes. Twenty years ago, the sharing was more obvious. “This is one of the few pieces I have left from my work in the 1990s,” Burhans said, holding up a fish-shaped vase. Brightly glazed, dappled greens and blues surround the fish’s yellow-orange body. The fish’s fins, some sporting wavy textures, extend from the body of the vase. Today, Burhans’ work has evolved into something much more subtle, more evocative than actual. Burhans wheel-throws his straight-walled casserole dishes, for instance, shapes them into an oval, then pinches the ends slightly, suggesting the bow of a canoe or simple boat. He lets the pieces dry, then uses a wooden stylus to carve wave-patterns into the sides of the vessel. Sometimes the handles take on the shape of a shell or wave. 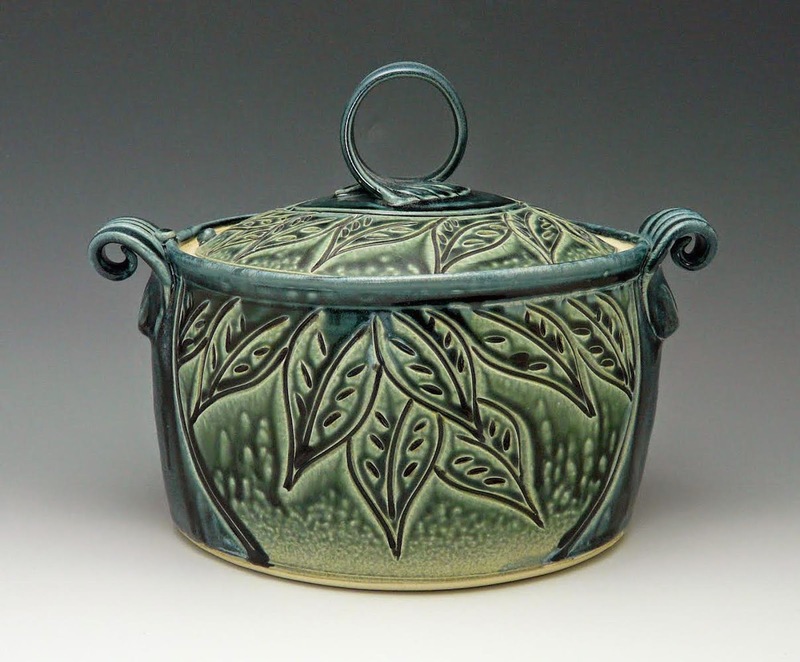 After firing the vessels in one of his three kilns, Burhans glazes each piece, often with sand tones accented with greens and blues. Then he fires the pieces again at an even higher temperature until the glaze turns to glass and the clay becomes nonporous. Burhans grew up in the Twin Cities area knowing he would be working with his hands. His mother had a craft business, making slip-cast ceramic figures using molds. As a teen, Burhans worked with his father, who owned a sheet-metal manufacturing company. “I’ve got the scars to prove it,” Burhans said with a rueful chuckle, holding out his hands. But it was the fluidity of clay that beckoned Burhans, who studied both pottery and sculpture at St. Cloud State University in Minnesota. After graduating in 1980, he discovered a group of artists in Pinellas County. Burhans taught four classes a week while developing his own business, and the art center provided him studio space. For Burhans, it has meant years of cultivating wholesale customers—his work is sold in a number of galleries around the country—as well as investing in the art community where he lives. Today, Burhans teaches one class a week at the DFAC and the Burhans own Clay& Paper Gallery of Art in downtown Dunedin that features the work of several area artists. Most days, however, he slips on headphones, tunes in to some classic rock or blues, and settles in behind the wheel. Burhans works alone in his studio at his Indian Bluff Island home, making elegant but functional stoneware designed to be used, not just looked at. Each piece must be very similar, although not exact, in size and thickness to the others he has made. Customers expect the pieces to bake food, for instance, at certain temperatures for particular lengths of time; a difference in thickness might affect how a recipe turns out. Within what some people might see as limiting parameters, Burhans plays with variations of form, design, and color. Every piece shaped by Burhans’ hands carries with it a bit of his life. And he never knows exactly how each piece will turn out until it emerges from the kiln. Tour-goers following the south-to-north route will find Burhans’ studio listed as the second stop. Park in the cul-de-sac area near his home and follow the wavy molded-concrete walkway—inlaid with bits of broken ceramic tiles—to the left around back to find the kiln area. Burhans opens his kiln around 10:30 a.m. and visitors are invited to join the chain and help pass the pottery hand-to-hand from kiln to table outside. Visitors also can climb the stairs in the front—look for the colorful collection of ceramic starfish lining the overhang above the garage—and walk in to the Burhans’ living area where guest artists Alan Bennett and Brenda McMahon will display their work. This year, visitors can make a donation and play Spin-the-Wheel to win various prizes; proceeds go to support WMNF and the SafetyHarbor Art and Music Center.